1. Pharaoh Nico II appoints Jehoiakim king of Judah in 609 BC. 2. 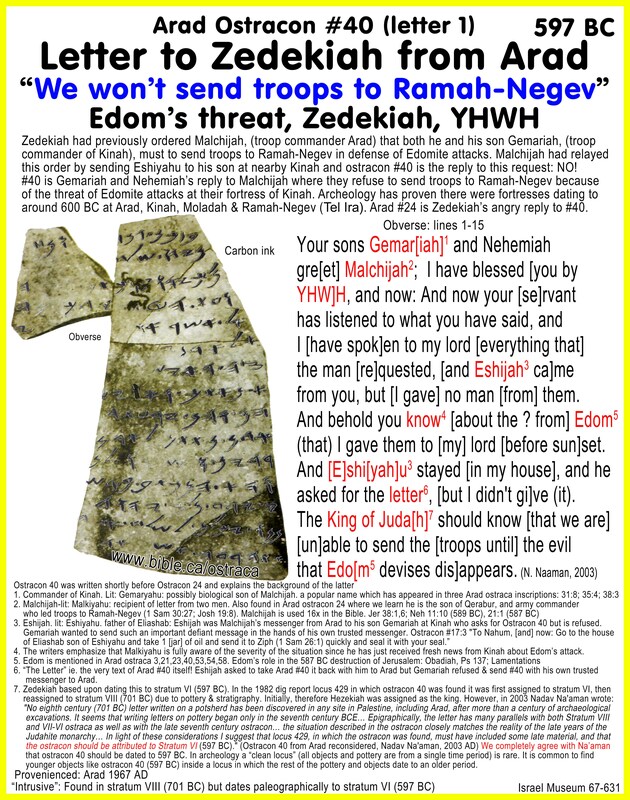 Edomites move into the Judean Negev and Zedekiah orders troops for defense. 3. A man seeks asylum in the temple of Solomon. "What we read in the book, we find in the ground"
Excavated 1962-1967 AD from an official archeological dig, these ostraca were the written records of communications between Jerusalem and the city of Arad and the king in Jerusalem at the time Nebuchadnezzar attacked Jerusalem 605-587 BC. 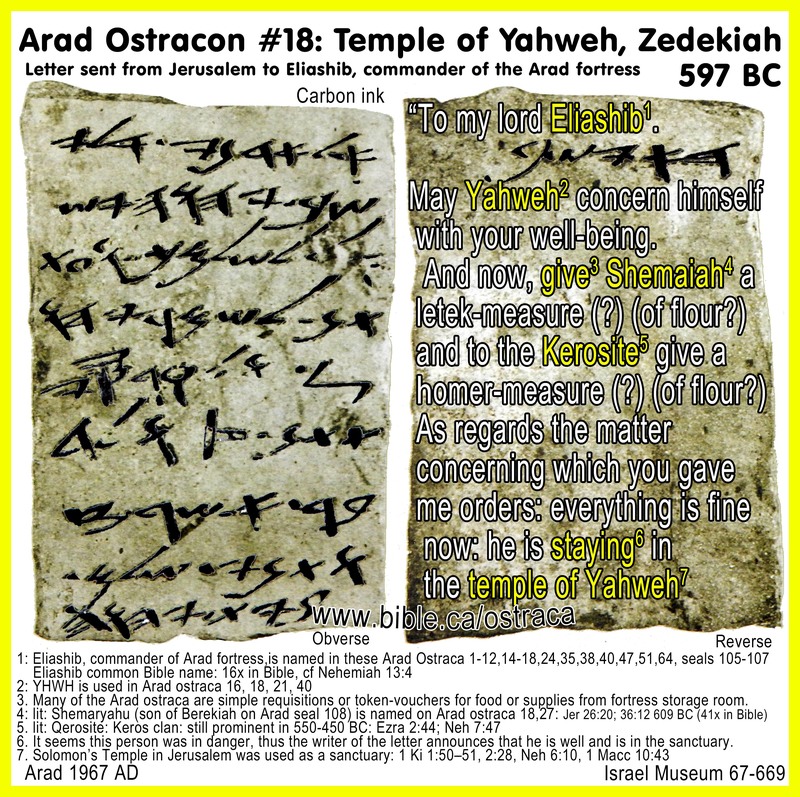 Arad #40 "Letter to Zedekiah"
Arad #18 "Solomon Temple Sanctuary"
Arad #88 "Neco II appoints Jehoiakim"
Ira #1 "Commanders of Ramah"
The vast majority of ostraca found are ink writing on broken pottery sherds. In these cases the broken pottery was a cheap and abundant paper to write on. FIVE OSTRACA: From a Biblical point of view, the most important of the 180 ostraca (and a few bulla) excavated at Arad 1962-1967 Ad are the four we have chosen to in this study. 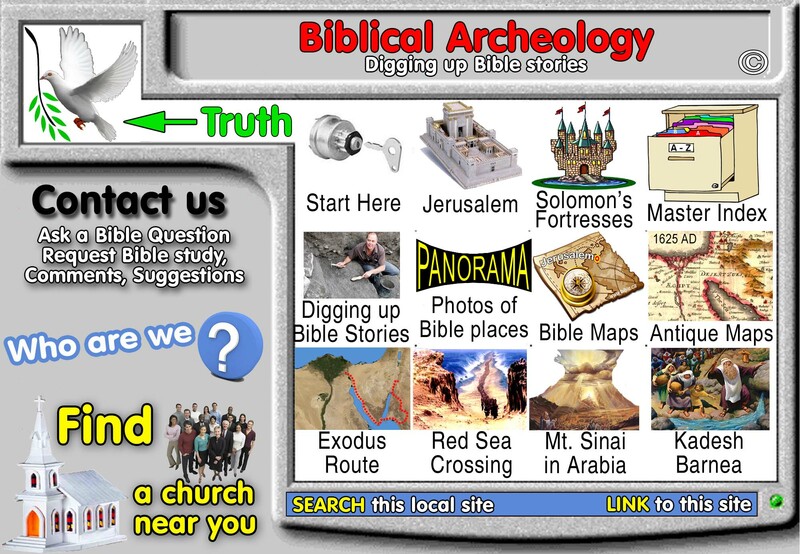 We have added one from Tel Ira (Ramah-Negev) for a total of five in this study. 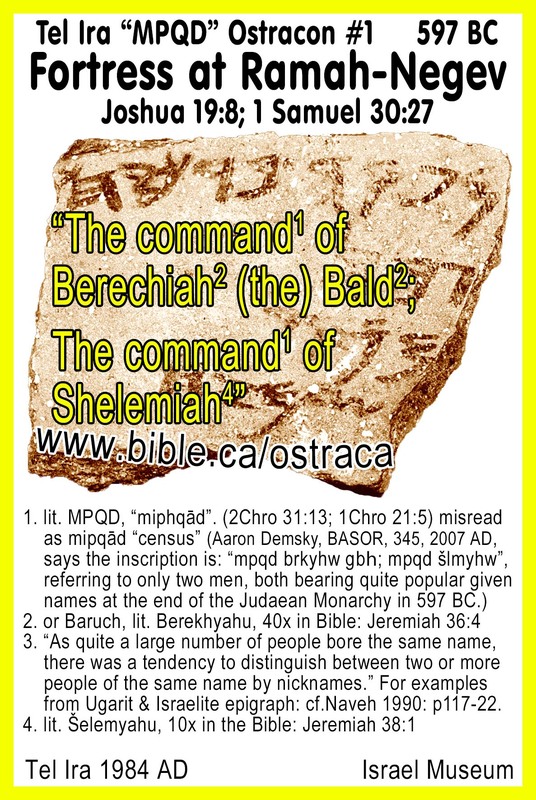 Two ostraca (Arad #40, #24) record the communications between the city of Arad and Zedekiah, king of Judah at the time Nebuchadnezzar attacked Jerusalem 605-587 BC. 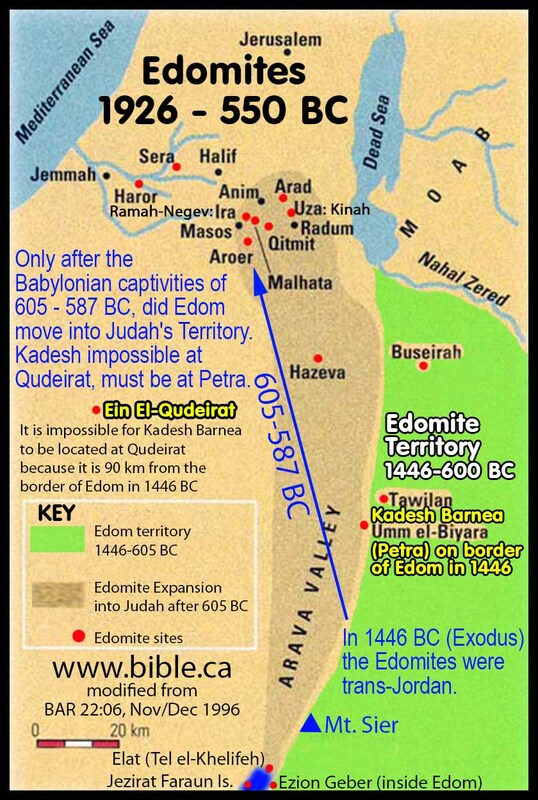 The Edomites had moved for the first time into the Judean Negev and Zedekiah orders troops for defense. Excavation report: Aharoni, Y., with the cooperation of Naveh, J. 1975. Arad Inscriptions. Jerusalem (in Hebrew). Dipping is where you take freshly excavated pottery sherds and simply dip them in water to look for possible inscriptions before they are cleaned with a brush. Arad is a city with a long period of occupation and as such we should not be surprised to find many different periods of ostraca. The archeological dig report says that ostraca was found in these occupation levels, each of which correspond to a date: Stratum II, III, V, VI, VII, VIII, X, XI. Note: + numbers in totals are ostracon dated based upon epigraphical comparison as opposed to where they were found. It is common in archeology to find pottery and objects of one date in a stratum level from another time period. Vouchers used to redeem goods, supplies, food, money. Vouchers were written on pottery sherds that acted like tokens or "I owe you" that could be exchanged for various goods stored at the Arad fortress from the time of Josiah (640 BC) down through Zedekiah (597 BC) and then to the Persian era 500 BC. Often impeded in rings or worn around the neck or wrist. Usually in two or three lines of text. (Lines are separated by "|"). All are two lines except #108 which is three lines. Three different seals (#105-107) of Eliashib, commander or supply manager of the Arad fortress were all found in the same room of stratum VII (597 BC) along with Arad ostraca #31,32,34 and other pottery. VI. Who was Eliashib and what was his role at Arad? Eliashib was the top ranking official and/or commander of the entire Arad fortress. This is the view taken by the dig directors at Arad. Eliashib was a non-military bureaucrat of the king: We, on the other hand, believe Eliashib was not the commander but functioned under the commander as executive director of supplies and logistics. He may have been an official appointed by king Zedekiah to control the flow of goods and even troops as the kings command. The commander of the entire Arad fortress was a soldier who directed troops the king assigned through the direction of the king via Eliashib in battle. So instead of the military commander of the fortress, Eliashib was a non-military bureaucrat of the king. 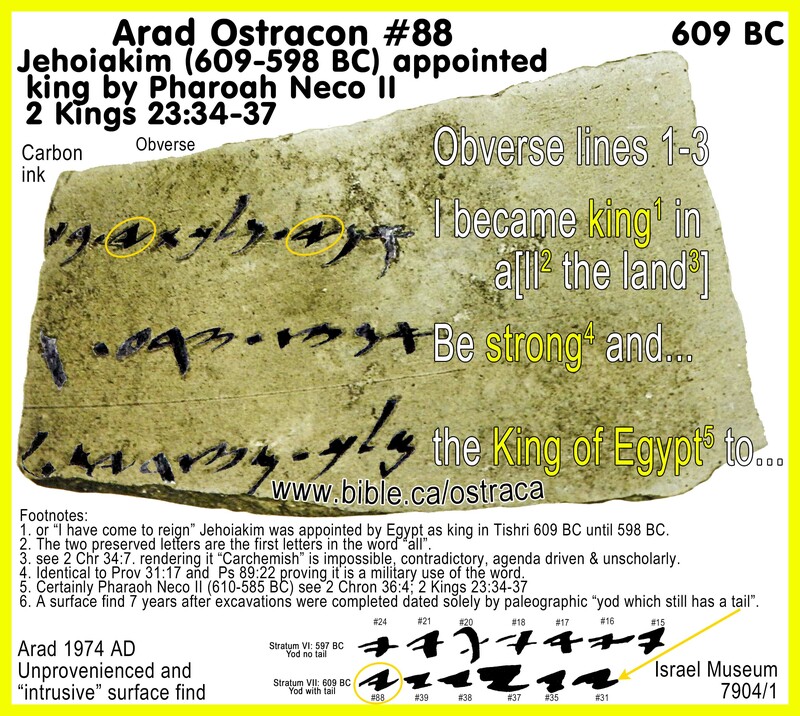 From Arad ostraca #88 we have direct evidence that Pharaoh Nico II appointed Jehoiakim, king of Judah in 605 BC just like the Bible says. 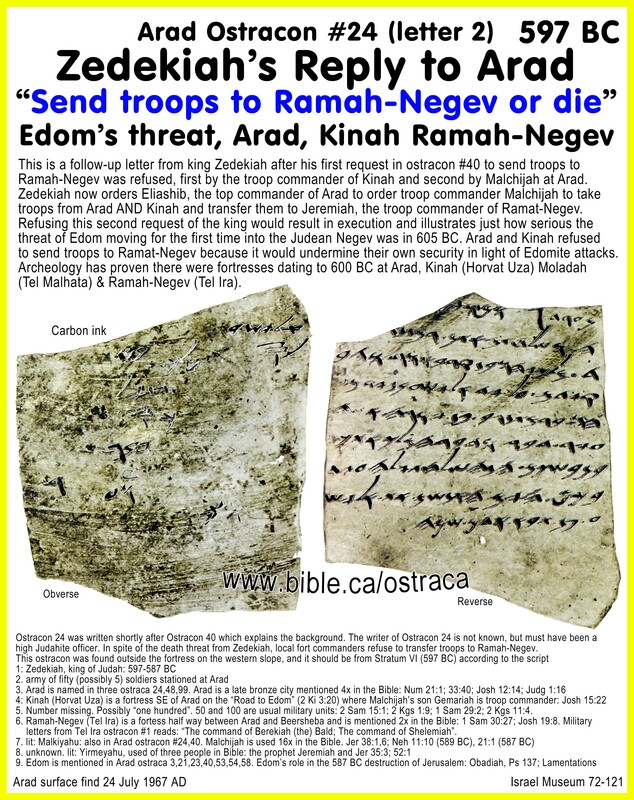 From the Arad ostraca #40 and #24 we clearly see the invasion of Edom for the first time into Judean territory which generated two letters between king Zedekiah and the commanders at the Arad fortress to send troops for defence to neighboring fortresses under attack. 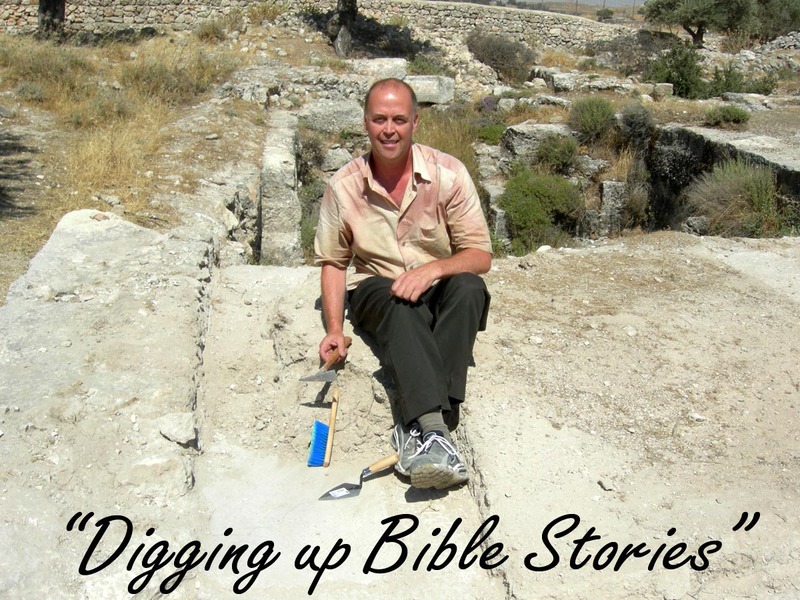 First letter: Details of Arad #40 "Letter to Zedekiah"
Second letter: Details of Arad #24 "Zedekiah's Reply"
This deeply troubled Zedekiah and he lost the battle in the end with the destruction of the temple in 587 BC. After this Edom moved into occupy the Negev in Arad and other near by cities. From Arad ostraca #18 we have a direct reference to the Temple of Solomon in 597 BC where a man was seeking refuge inside for reasons unknown. Details of Arad #18 "Solomon Temple Sanctuary"
This may be the very last reference to the first temple period sanctuary we have form archeology. The Arad ostraca and seals provide a vivid picture of the world of Zedekiah, king of Judah in 597 BC. The ostraca show the internal workings of government from Jerusalem to the outer fortresses in the negev of Judah. We see the kinds of commodities being traded and the types of food consumed. 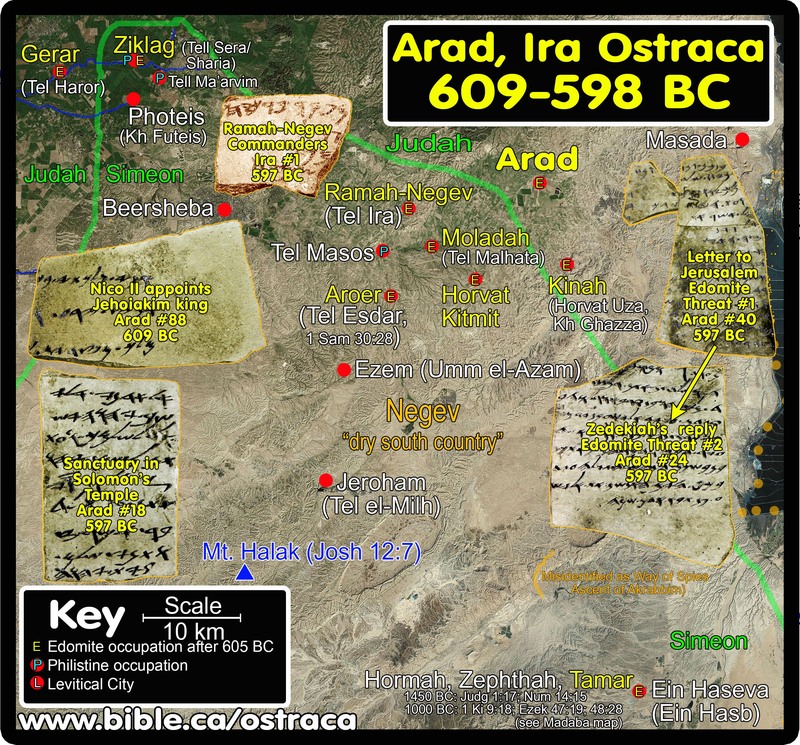 The one ostracon from fortress at Ramah-negev (Tel Ira) is ten km west of Arad and shows two commanders received orders there in 597 BC. What you read in the book you find in the ground!